PLD Space and RUAG Space have signed a long-term collaboration and Supply Agreement regarding lightweight carbon composite structures for small launch vehicles. This agreement is related to PLD Space’s Suborbital ARION 1 and Orbital ARION 2 launch vehicles and covers the application and use of RUAG Space’ novel product family FlexLine. These products feature lightweight carbon composite standardized payload fairings and interstage adapters with their separation systems. 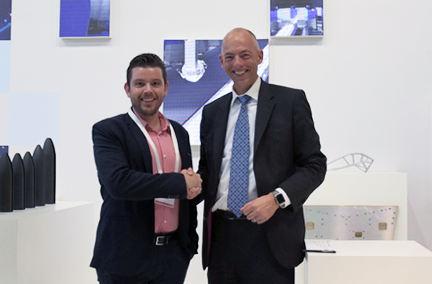 Holger Wentscher and Raúl Torres sign agreement between RUAG Space and PLD Space at IAC 2018 in Bremen, Germany. PLD Space will apply FlexLine products from RUAG Space as a pilot customer on its new launchers, which are under development for servicing the emerging small satellite worldwide launch demand. “RUAG is the world’s leading fairing manufacturer for world class launch vehicles, including European ARIANE 5 and VEGA as well as the U.S. launcher, ATLAS V. PLD Space with ARION 1 and ARION 2 joins this select group of launchers for which RUAG provides this critical structure. It is very good news for the NewSpace industry," points out Raúl Torres, CEO and Co-founder of the company. Holger Wentscher, SVP, Launchers, at RUAG Space said that using the FlexLine products reduces launcher development cost and time-to-market significantly. The FlexLine products allow customers to use mass optimized, plug-and-play products at a series cost that is best-in-class.